Thursday night my buddy Brian and I drove up Mount Baldy to do some casual observing. Brian probably wouldn’t describe himself as an amateur astronomer (yet), but I’m working on him. We’ve been talking for months about going out with binoculars and a planisphere and just spending some time learning the sky. When I got back from Uruguay I realized that Brian had been in town for a year and we hadn’t been out observing yet, so I started bugging him regularly. Thursday night, we went. It was just by chance that Thursday night was the peak of the Perseid meteor shower; we were going out anyway and the meteor shower didn’t affect our decision one way or another. But it was a nice perk, and we both saw some excellent meteors up on the mountain. Not as many as we might have if we had gone for that purpose, because the best meteor watching is done with both eyes wide open, laying on the ground or on the hood or trunk of the car. Even binoculars cut out so much sky that you’re more likely to miss meteors than to see them if you’re scanning the sky with binos. That said, Brian did catch at least one through binoculars. Brian had along his 10x50s and I had my 10x50s, 15x70s , and SV50. We looked at just about every good target with all three instruments. Usually we’d find things with the 10x50s, kick things up a notch with the 15x70s, and go to the SV50 for a steady fixed view and sometimes for more power. 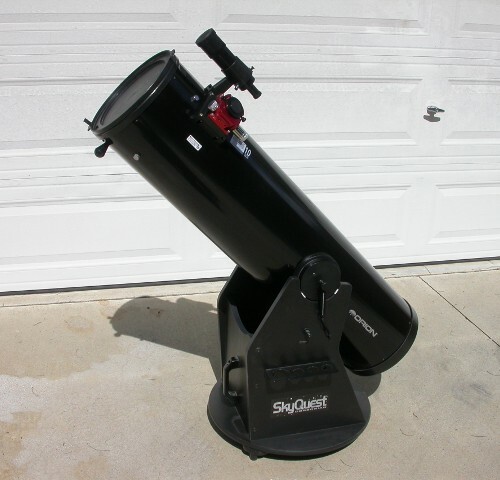 It was a useful, easy-to-use set of instruments that I thought complemented one another well; my only regret was not bringing the eyepiece rack for the telescope mount, because I spent more time than I wanted fiddling with end caps when I was switching eyepieces on the telescope. We started out facing south, down the mountain, toward Scorpio and Sagittarius. Those are two of the most recognizable constellations, Scorpio because it actually looks like a scorpion and Sagittarius because of the striking ‘teapot’ asterism. They’re also prime territory for deep-sky observing, with binoculars or telescopes of any size. Our first target was M7, just above the “stinger” of Scorpio. M7 is a BIG, bright cluster, and it looked pretty darned good even though Scorpio was down in the light dome over LA. M6 is right next to M7 and looks like its smaller sibling. From there we went up into Sagittarius, to M8, M22, and M24. M8 is the Lagoon Nebula, and M22 is the brightest globular cluster in Sagittarius. M24 is “not a ‘true’ deep sky object, but a huge star cloud in the Milky Way, a pseudo-cluster of stars spread thousands of light years along the line of sight, perceived through a chance tunnel in the interstellar dust”, according to its SEDS page. At that point I was doing something else–switching eyepieces on the telescope, as likely as not–and Brian was just cruising with the 10x50s when he ran across another bright cluster. We identified it, and several other “discoveries” of the evening, by the following process: one person would find something in binoculars, and then hold the binos with one hand while getting a green laser pointer on target with the other hand. Then the other person would follow the line of the green laser to the target using his binoculars. That first time, the target was M11, the Wild Duck Cluster, one of the true gems of the summer sky. Other “discoveries” sent me scrambling for the star atlas. By that point we had been facing south for more than half an hour and we needed a stretch and a change of pace. We hit M13, Epsilon Lyrae (the Double Double star), and M15 in the mid sky before settling down to face north. Our first northern target was M31, the Andromeda galaxy. It was grand. We also spotted its two satellite galaxies, M32 and M110, without much trouble. By that time the Double Cluster had cleared the treeline to the north so we spent a few pleasant minutes contemplating that celestial showpiece. Then we just panned around Cassiopeia taking in all the good stuff. Even with binoculars, you can spot clusters in Cassiopeia faster than you can identify them, unless you already have them committed to memory, and we saw a lot more than we logged. Specific objects that we noted or looked up included the open clusters Stock 2, M34, and NGC 457. Our last two objects were M33, the Triangulum galaxy, and the Engagement Ring of stars around Polaris. We wrapped up about 12:30 AM after a solid hour and a half of unhurried observing, during which time we had seen several asterisms, one nebula (M8), one identified double star (Epsilon Lyrae) and at least one unidentified by us, seven identified open clusters (M7, M6, M11, the Double Cluster, Stock 2, M34, and NGC 457) plus several more unidentified, three globular clusters (M22, M13, and M15), five galaxies (M31, M32, M110, M33, and our own Milky Way arcing high overhead), and a galactic star cloud (M24). So we had seen at least one of just about every class of deep sky object except for planetary nebulae and dark nebulae. If I’d been more target-oriented I would have remember M27, the Dumbbell Nebula, and then we’d have gotten a planetary as well. But I wasn’t target-oriented. I was just there to have fun surfing the sky with a friend. I had a heck of a good time, and I think Brian did too. I’m already looking forward to the next time out. In a comment on the last post, Jon Lindberg brought up some good points about the aperture/portability tradeoff with telescopes. It’s fertile ground for discussion, because there is always a tradeoff. The big up-front ground rule for this discussion is that when it comes to portability, your mileage may vary. Some people consider 8″ or even 10″ scopes to be “grab-n-go”. For me, scopes break roughly into two categories: those that require one hand and one trip–my definition of grab-n-go–and those that require some more setup, either two hands or multiple trips or other fiddling. And at any given time, there is only one scope in each category that I’m using heavily. Right now my big gun is a 10″ Orion dob . It weighs about 55 lbs assembled, which is about half in the tube and half in the base. I can move it while it’s assembled, but usually not without having a few twinges in my back the next day. So I usually carry the base to where it’s going to be set up, then put the tube on, then set up some kind of chair next to the eyepiece. Including a trip for my eyepiece case and some charts, it’s usually about four trips. 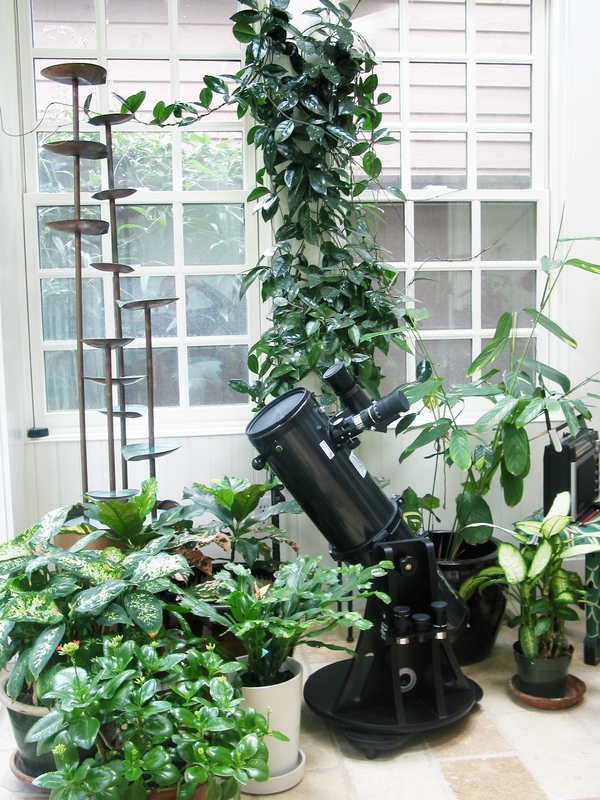 But that’s okay, because I only tend to set it up when I’ve got some serious observing to do, or when I want to impress houseguests. 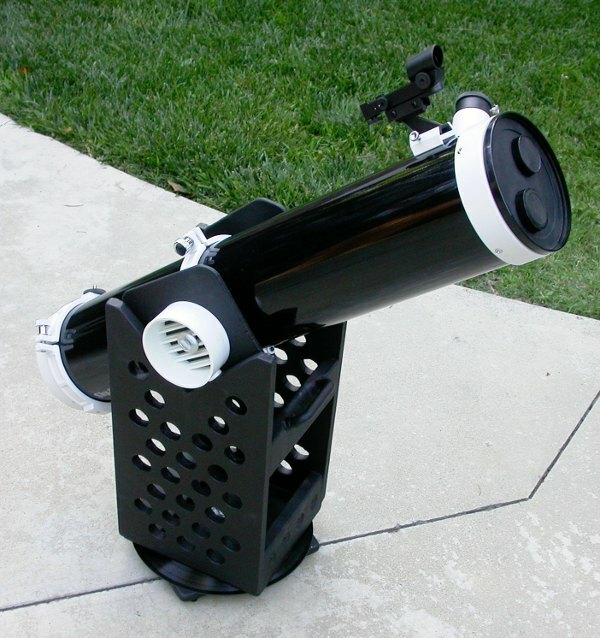 My old “big gun” was my first telescope, a 6″ Orion dob . It weighs about 33 lbs assembled, and I always carry it out in one piece. But it lives out in the garage with the 10″ and also requires a chair, so I’m still making two or three trips to get it set up. If I’m going to go to that much effort, I might as well get out the 10″ and get the benefit of nearly three times the light-gathering ability and almost twice the angular resolution. So I’ve barely used the 6″ at all since I got the 10″. The 6″ is also facing competition from the other end, from my 5″ Skywatcher reflector on a homemade Dob mount. That one weighs just under 20 pounds and is short enough that I can use it sitting on the ground, so it’s more grab-n-go-able and still delivers most of the performance of the 6″ scope. One of the lessons of all of this might be that I have too many telescopes. The more broadly applicable point is that the goodness or badness of a telescope for any particular application depends on what else you’ve got in the stable. When I only had one telescope, it was of necessity both my big gun and my grab-n-go scope. But my enthusiasm for hauling out a 30 lb scope on short notice declined markedly when I had something under 10 lbs to use for quick peeks. But let’s get on to the meat of Jon’s question, which I am going to interpret as, at what point as you go down in aperture do you start noticing the compromises? Again, the answer will be different for different observers. Some people think that anything smaller than 8″ is a waste of time. Obviously I disagree. I think that the vast majority of observers would say that a 3.5″-4″ telescope is probably at a threshold between noticeable compromise and being to see most familiar targets–moon, planets, Messier objects, the occasional comet–with rewarding vibrancy and detail. I base that in part on the massive commercial success of 90mm Maksutovs and 4″ refractors, especially apochromats. Also, some of the best deep-sky observers in the world like Stephen O’Meara and Sue French use 4″ refractors as their primary scopes. That’s not to say that smaller telescopes aren’t popular as well. Refractors in the range of 60-80mm have always sold well and probably always will, especially short focal length, widefield scopes like Orion’s ShortTube 80 (pictured above). And you can have a lot fun pushing these little scopes to their limits, as Jay Reynolds Freeman did when he completed the Herchel 400 with a 55mm scope. But achievements like that get noticed because nobody expects to be doing serious deep-sky work with a tiny telescope. Sub-3″ scopes are almost always intended to be either introductory-level instruments or purpose-built grab-n-go and travel scopes. So what’s the real word? My little SV50 is well into the realm of trading away performance for portability. So far it has shown every Messier object I’ve tried for, but all but the biggest and brightest have been faint fuzzies at the eyepiece, without a great deal of detail. And a scope that small absolutely requires dark skies to do any meaningful deep-sky work. Here in town it just doesn’t have the horsepower to cut through the light pollution. But that’s okay, because I didn’t get it to use here in town. I got it mainly for airline travel, and if I’m flying, it’s usually to someplace darker than the LA area, so it fills its very specialized niche admirably. One thing that the little scope excels at is putting a truckload of stars in my eyes. Bigger scopes with longer focal lengths have smaller fields of view, that’s just an inescapable fact of optics. I’ve noticed that when I’m using bigger scopes I’m usually hunting for particular targets. With the SV50 I have a lot of fun just panning around the sky. It is the only scope that I have used that delivers the same super-wide field of binoculars, but with the advantages of being solidly and comfortably mounted (image crouching behind a pair of mounted binoculars when they’re pointed at a target more than 45 degrees above the horizon) and having variable magnification. For a little more than double the weight and volume, the C90 is still very portable and delivers a LOT more light and a LOT more detail. But for me it has two distinct disadvantages compared to the SV50. First, it’s just big and heavy enough to require a bigger tripod, so the whole kit-and-kaboodle won’t fit into a tiny bag that I can stuff into the bottom third of my backpack. So if I’m traveling with it, it becomes one of the focuses of my packing, instead of something I just shove in the bag and forget about until I reach my destination. Also, the folded light path gives the C90 a very long focal length for its size–900 mm–which makes reaching high powers a breeze. That makes it easy to power up on planets and specific deep-sky targets, but it also means that the scope has a fairly narrow field of view. So my mindset when I’m using it is more along the lines of, “what individual small thing am I going to look at next”, and not, “let me pan around the sky and see what I stumble across”. If you want the latter experience in a more capable scope than the SV50 that still only weighs about 5 lbs and is eminently airline portable, consider a Short Tube 80. If you’ve got a little more space and don’t mind a little more weight, a 4″ Mak or a 5″-6″ Schmidt-Cassegrain will put a lot of aperture into a decently small space. Something like a Celestron C5 is about the size of a big coffee can but gives you enough light grasp and resolution to go after just about anything you want, especially if you have dark skies. The caveat I’ll add from my own bitter experience is that at this size of scope you have to put as much or more thought into the mount. When I got my first Mak, a 4″, I put it on a cheapo camera tripod from Wal-Mart. That was a disaster–the mount was so shaky that using the scope was an exercise in almost terminal frustration. Moving down to a 90mm scope didn’t really help, and my little scopes didn’t get much use until I got a decent tripod. And by “decent” I mean “costing as much or more than the telescope itself”. I brought up the Short Tube 80 and all of the catadioptric scopes (Maksutov-Cassegrains and Schmidt-Cassegrains) first because they’re probably the most airline-portable of the bigger scopes. If portability is important but you don’t plan on flying with the scope, at least not regularly, the Orion StarBlast 4.5 and Edmund Astroscan both put some serious aperture into a one-hand telescope. 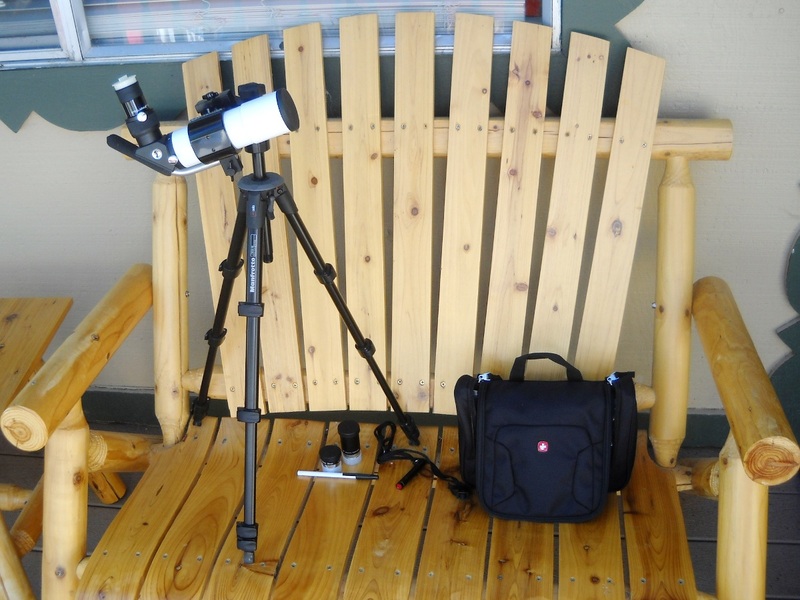 Both are bulkier than a 5″-6″ SCT, but in both cases the bulk includes a base so you don’t have to worry about buying a separate mount and tripod (although you may want something, even a picnic table, to get them up off the ground). The StarBlast has better optics and a better focuser, but the Astroscan is almost indestrucible. As with any optics purchase, read around to find out the good and bad about them both before you make any decisions. The links to telescope reviews on the sidebar are good places to start. 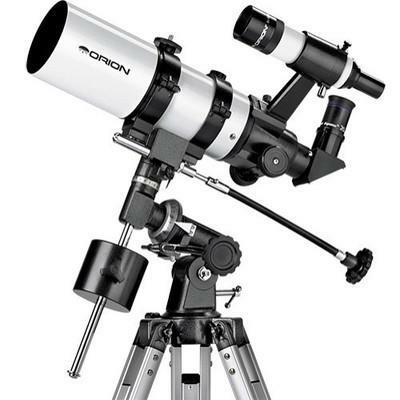 Most telescopes are made in China and Taiwan these days, and the same models that are sold by Orion and Celestron in the US are usually available from SkyWatcher or Konus in the rest of the world. Happily, just about all of the scopes I’ve discussed can be had for $200-300 or even less if you’re willing to shop used (for example, at the Cloudy Nights Classifieds, where I’ve bought and sold just about all of my astro gear). If you have any questions, feel free to ask in the comments. I’m always happy to talk about telescopes. UPDATE March 11, 2013: Here’s Doug Rennie’s StarBlast 6 hanging out amongst the flora–see comments for explanation! You are currently browsing the 10 Minute Astronomy blog archives for the day Saturday, August 14th, 2010.